Don't miss the opportunity to get to know these three essential attractions on the surroundings of Madrid in two days! The first day discover two cities declared World Heritage Site: Ávila and Segovia and enjoy a guided visit inside the Monastery of El Escorial. The second day you will have a tour to the monumental city of Toledo. On the day one leave Madrid early in the morning and head towards Ávila, where you will stop at the Cuatro Postes viewpoint. After, travel to the city to start the walking tour, and pass by the Sanctuary of San Vicente, the cathedral and of course, the walls. Next head to Segovia and on arrival your guide will explain everything about the creation of the aqueduct by the Romans. Then continue your route through the streets of the city center, and pass through the Cathedral, continuing through the district of the Canonries, until you reach the famous Alcazar, a symbol of the art and history of Spain. Then you have free time to enjoy lunch, do some shopping or access some of the monuments on your own. 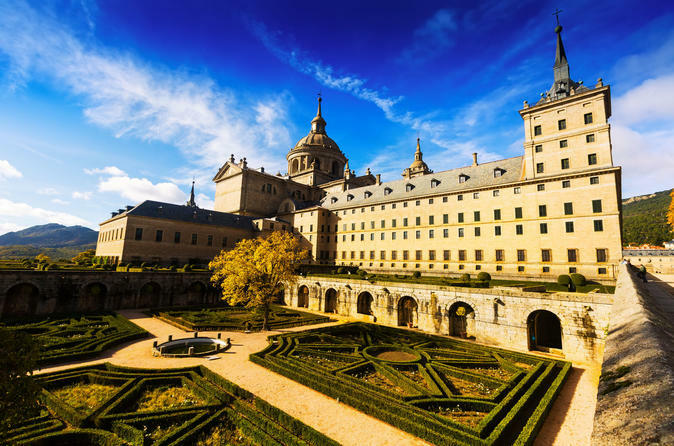 Once the break is over, go to El Escorial, where you will visit the inside of its Monastery. There, under the guidance of your guide, discover the architectural complex that includes a royal palace, a basilica, a pantheon, a library, a school and a monastery. Late in the afternoon, return to Madrid in your comfortable vehicle. On the day two you’ll visit the city of Toledo, a UNESCO World Heritage Site. Your city tour begins with a walk to the Alcazar and the Cathedral. You’ll also visit the Church of Santo Tomé, which houses a number of important sculptures. Explore the Jewish Quarter, characterized by its tangled maze of steep-sloping streets. You’ll have a chance to visit the Sinagoga de Santa María la Blanca, Mirador del Valle, and the Monastery of San Juan de los Reyes. We will make a break at midday so you will have time to have lunch on our own. In Toledo you can enjoy some traditional spanish restaurants or something quick if you prefer to continue exploring the city by yourself. You’ll undoubtedly learn a lot about the architecture, history, and culture of the most important cities aroung Madrid during your visit. Special Offer - Book by October 19 to save 50% off our previously offered price! - Book Now!